Last week was such a lovely week temperature wise here in Florida. It was nice and cool. I was able to whip out some cardigans and boots, one of my favorite things about cooler weather. That weather also made the fall decor feel so much more in place! I took a few pictures of it to share. It’s not fancy, but just a little decoration change here and there throughout the year helps keep things from getting boring, don’t you think? One of my favorite places right now is our fireplace. I had so much fun decorating it! It’s our first time with one, so I took advantage of it. I made the banner last year and it was perfect for this place on the mantle. 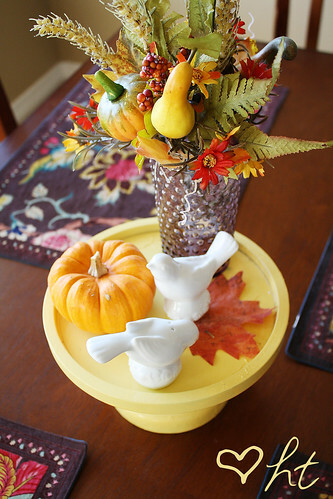 The table is full of fall colors but I still made it work with my bright yellow and blue seat cushions. The yellow stand is a rock/candle decorative thing that I spray painted. 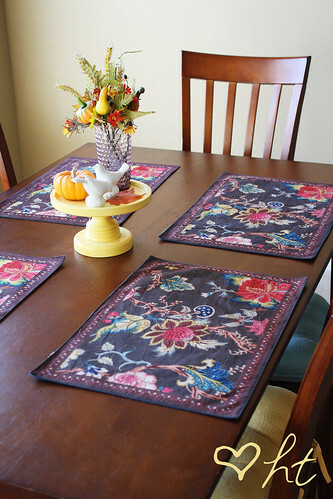 I found the beautiful place mats at World Market (my new favorite store here!!!! It reminds me of Anthropologie’s home department :). The purple glass that the leaves are in is from there as well. The bird salt and pepper shakers were right at home here too. They have also become my daughter’s new favorite thing to play with when she’s eating. Another fun find at World Market was this dish towel. 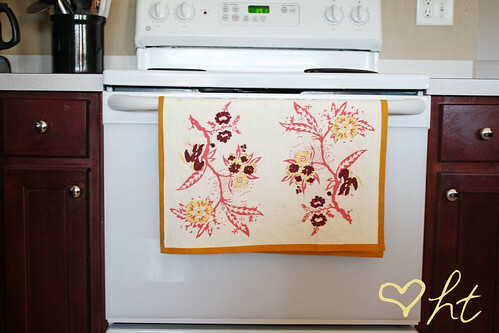 If you like Anthropologie dish towels, you will love theirs!!!! And theirs are a lottttttt cheaper. This one was only $3.99!!! Unfortunately, they don’t have very many online, but they have a ton in the store. I even made a dress for my daughter with one. I’ll get around to pictures one of these days…..
as book shelf. It was so much fun decorating with my daughter. I am really looking forward to decorating for Christmas with her too. I love making wonderful memories with my family. Looks great! I want to make your banner. 🙂 We moved to Tampa in July so it is my first fall in a warm climate. I was so thankful for the weather recently. 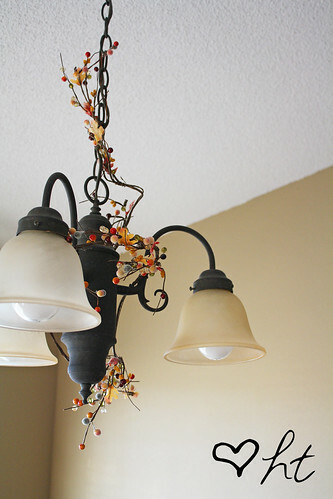 Nice and cool…..
Love the touches of Fall you added to your home. Also love your fireplace, the fireplace was the first thing I checked out when we were looking for a house. Your new home is lovely. It has such a clean look to it. We are moving again next month and I hope to have a ‘cleaner’ look there. We’ll see, we’re all collectors at our house! I <3 World Market. Ours closed a few years ago. I do miss it badly. 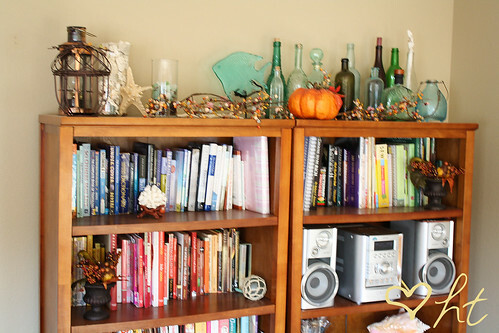 Your fall deco looks great! Would love instructions on how you made your banner. I am hosting my first Thanksgiving this year and this banner would look great. It’s still in the works!! 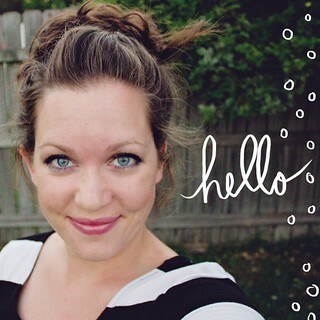 I’ll link to you when I post the projects that have inspired me from your page! Tankful Bunting. AMAZING! I want to come cozy up on your couch and drink apple cider. Oh I love this! We’re moving in three weeks and I can’t wait to start decorating the new place. Also, thanks for the dishtowel tip – look forward to seeing the dress you made! It is fairly simple. I cut out triangles from linen material. Then I used freezer paper stencils to paint on the letters. I then glued on the triangles to a piece of twine like stuff and tied bows of vintage lace in between each letter. I love Cost Plus too. I don’t know if you drink coffee, but I love their seasonal blends (the Pumpkin Spice was great). And if you buy 6 bags of coffee, you get one free. If you are an explorer (it’s free, like a rewards card). Also, I know I’m commenting on the wrong post, but I love your thoughts about scheduling and discipline. It was a great reminder that I need to be better at self discipline, especially with working out. I’m with you on not needing to lose weight, but wanting to be healthy. And sometimes that just doesn’t seem like enough!